We’ve had a busy couple of days preparing the first ten pages of Róisin Dubh so they can be bound into a small preview comic. Stephen has been working flat-out, lettering and making tweaks to the final cover. Up to this point I’ve only seen the pages with Stephen’s dramatic artwork, so it was a thrill to see the captions, character balloons and sound effects. It feels like a real comic now. Stephen, as usual, has produced excellent work. I’ll see if we can get a page or two up in the coming days. At last today the comic went to the printers! I’m looking forward to holding our mini-comic book in my hands. Next week I’m attending the World Horror Convention in Brighton, UK. It’s the first time this convention has been held outside of the American continent. It will also be the first World Horror Convention I have attended. Both of these factors mean I’m very much looking forward to the event. 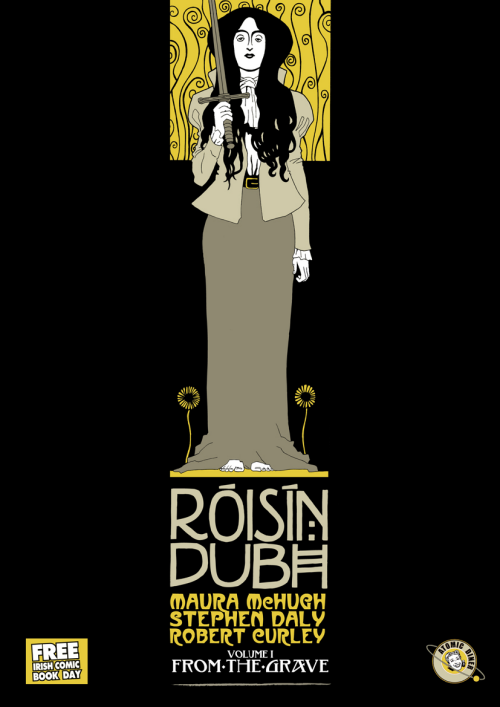 I’ll also have copies of the Róisín Dubh mini-comic with me, to show off to the comic book aficionados. The following weekend I’ll be going to Odyssey 2010, this year’s Eastercon, in glamorous Heathrow. Eastercon is the largest speculative fiction convention in the UK, and there will be 1200+ people at the hotel. It will be another great opportunity to get advance word out on the forthcoming graphic novel. Posted on March 16, 2010, in news and tagged conventions, Roisin Dubh, updates. Bookmark the permalink. Leave a comment.